See “Weekly Rhythm” below for comment and questions to engage with the readings. Also “Praying the Lectionary Readings” below for prayers based on the readings. Leviticus 19:1-2, 9-18. Social holiness defined: loving your neighbor, whatever their condition, as you love yourself. 1 Corinthians 3:10-11, 16-23. Paul reminds the Christians in Corinth they are the temple of God. They are to honour their bodies as God has made them and be grateful for all leaders who lay or build on the foundation of Christ. Matthew 5:38-48 “You have heard it said… but I tell you,” Part 2! The nearing of the kingdom of God means we are to (and now can!) treat those who harm us, (oppressors and enemies,) very differently than we may have been trained. This week’s suggestion: Don’t be too quick to move off the adoration focus. Read the verse and spend a couple of minutes meditating on it before moving into confession. Confession: Lord we are small you are big. Forgive our pride. The Word: See readings above or use your own reading plan. Shared Focus: God calls and we offer ourselves in response, discovering who we are. This week pray focussed prayers for the world as you encounter it. What circles do you engage with? As you pray for these areas each day, begin to think of ‘call’: What service may God be calling you to? Or how may God be guiding you in terms of the service that you are already involved in? Personal prayers: (Use this section to list people you need to pray for or situations of personal concern that you need to bring before God in prayer. Lord we are small you are big. Give us love, strength, guidance and power to go where you send. Confession: Lord we are small you are big. Forgive our self-sufficiency. Shared Focus: See Monday’s focus. Confession: Lord we are small you are big. Forgive our short-sightedness and distorted vision. Personal prayers: See Monday’s focus. Confession: Lord we are small you are big. Forgive our inability to realise the gift of your Spirit. Confession: Lord we are small you are big. Forgive our tendency to hold all the praise for ourselves. Confession: Lord we are small you are big. Forgive our parochial care that limits the spread of your kingdom. Confession: Lord we are small you are big. Forgive us when we worship a “small” God. Leviticus 19:1-2, 9-18. Social holiness defined: loving your neighbour, whatever their condition, as you love yourself. 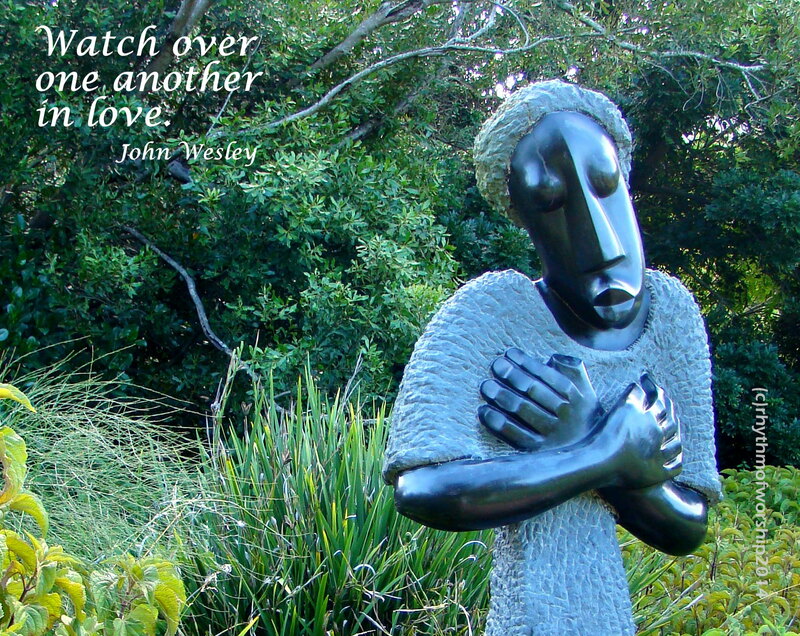 1) John Wesley calls us to, “watch over one another in love.” How can this passage be seen as a call to do this? 2) How can this passage apply to us today? 3) How does God “watch over us in love”? Pray this as a prayer: see The Message translation in “Praying the Lectionary” below. 1 Corinthians 3:10-11, 16-23. Paul reminds the Christians in Corinth they are the temple of God. They are to honor their bodies as God has made them and be grateful for all leaders who lay or build on the foundation of Christ. 1) How are our bodies Temples of God? Come at this question from a number of perspectives. 2) What are the implications of our bodies being temples of God? Matthew 5:38-48. “You have heard it said… but I tell you,” Part 2! The nearing of the kingdom of God means we are to (and now can!) treat those who harm us, oppressors and enemies very differently than we may have been trained. 1) How do you understand turning the other cheek? 2) Can you turn the other cheek without becoming a doormat? 3) How did Jesus turn the other cheek? 4) Who are your enemies? 5) What does loving your enemy mean? 6) Did Jesus love his enemies? How did he show this? 7) How can we love our enemies?